The storm clouds are forming, and the boat's almost ready! Take a flustered Noah, add a wife, three rambunctious sons and two of every living creature on the earth and you've got chaos! It'll take a lot of faith to get them through forty days and nights of life on this crowded vessel. The sons have their own ideas on how to pass the time with basketball, stand-up comedy and a buffet table. The timeless Biblical story of Noah and the Ark is told through the unique perspective of Mom and Dad Elephant (who, of course, remember it vividly). 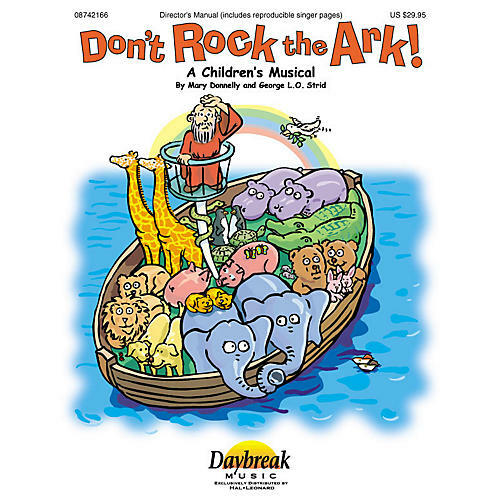 This easily-prepared 16-minute musical is perfect for younger children's choirs. The reproducible Director's Manual offers permission to photocopy singer's sheets and dialog, making Don't Rock the Ark a budget-stretching, creative presentation for any time! Available: Director's Manual, ChoirTrax CD, Preview Cassette, RehearsalTrax Pak (contains 12 preview casettes). Performance Time: 20 minutes. For Grades K-3.